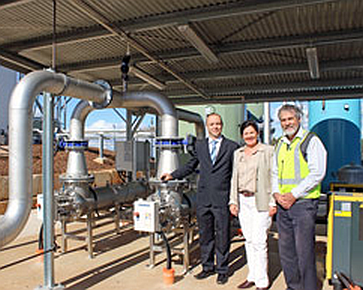 Toowoomba Regional Council (TRC) Water and Waste Projects portfolio leader Cr Nancy Sommerfield joined TRC Water Project Services officers and project contractors UGL Engineering for the official commissioning of the $3.6 million Pechey plant. Cr Sommerfield said the overall project cost of $5.3 million also included the $1.7 million Pechey to Hampton trunk water main, which will be completed later this year. The new plant replaces the existing water treatment plant at Crows Nest and later this year will also replace the Hampton Water Treatment Plant. Both facilities have struggled to meet water quality standards in periods of extreme wet weather and dam algal events. UGL Engineering Business Development Manager Morris Taylor (left), Cr Nancy Sommerfield and TRC Water Project Services principal engineer Will Higgins inspecting the new Pechey Water Treatment Plant. The new plant has a capacity of 25L/s (25 litres per second), incorporates an upflow clarifier, gravity media filters, UV disinfection, chlorination and clear water storage. Site facilities include control/monitoring systems and water testing equipment. Council awarded the contract for the design and construction of the Pechey plant to UGL Engineering Pty Ltd in August 2013. The contractor used a large number of local sub-contractors and suppliers to undertake the project works and the work was completed on schedule and within the budget. Successful performance testing and operator training was performed in July 2014, ahead of schedule.